Drs. 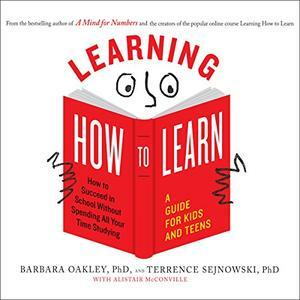 Barbara Oakley and Terrence Sejnowski's popular Online course Learning How to Learn, based on Dr. Oakley's best-selling book A Mind for Numbers, has enrolled more than 1.8 million students from more than 200 countries. In this much needed follow-up to A Mind for Numbers, the authors teach kids and teens how to learn effectively at a time when they most need these skills. Learning How to Learn teaches them about the importance of both focused concentration and letting their minds wander, how the brain makes connections between different pieces of information, the value of metaphors in developing understanding, why procrastination is the enemy of problem solving, and much more. Filled with application questions and exercises, this audiobook makes learning engaging and accessible.